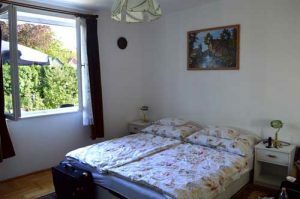 Guest Apartment Hotel Leander Haz 21 in Keszthely, Hungary; independent motel review. First Impression: Beautiful, quaint, charming – clean and extremely well kept. Bonus: Dog Friendly! 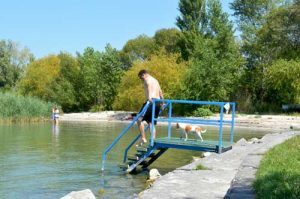 Find out more about our experience in the area: Lake Balaton, Keszthely, Hungary. 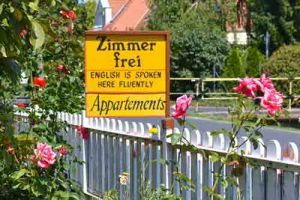 The lady who checked us in spoke absolutely No English or German, although the sign on the gate stated that “FLUENT” english is spoken. The fully furnished bachelor style apartment is spacious enough for two people. Our area was on the ground floor. Accommodation: Walk into a living / sleeping area with a small table with 2 chairs, book / shelving stand, small tv on a stand, wardrobe, big bed, 2 bed tables. 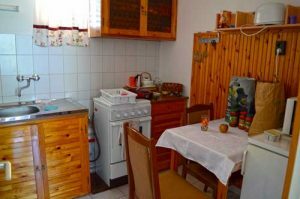 Through one door is the small kitchen with a small table with 2 chairs, stove, oven, small fridge, microwave, toaster, coffee machine, kettle, pots, pans, dishes, glasses, flatware, dish detergent, one tea towel, one sponge and a garbage can. Through the other door is the bathroom with toilet, sink, shower and 2 bath towels. There is liquid hand soap and many shampoos. Not sure if these are included in the stay or left behind by previous guests, so perhaps not in every accommodation, nice touch in any case. There was also a hair dryer and a bucket with mop. Outside is a beautiful garden with flowers, fruit trees, grass, sitting areas (too bad they do not make the smokers go there) and a huge vegetable garden in another area. The woman who checked us in is constantly working in the gardens. There are seating / relax areas in the inner garden as well as tables along the guest apartment fronts. – No fan or air conditioning. The heat is drastic and in combination with mosquitos and other guests intruding on privasphere, there should definitely at least be fans. – Lots of mosquitos at night – must close the window. No fan or air conditioning so very hot. Our only relief was to open the window after turning out all the lights and electronic devices. – Woke up in the morning to people sitting at the table directly outside our window, smoking and yakking. The table is right outside our window – look at the picture of the bedroom – it means they may as well have been sitting in our room! We get up, put some clothes on (who knows how long they have been getting a free show), and close the window. Hot again! It is really unfortunate, because the place is gorgeous, clean and for the most part relaxing. However, the above mentioned problems combined with a thankless, rude manager / owner? is an absolute reason to not go back and not recommend it to anyone else. 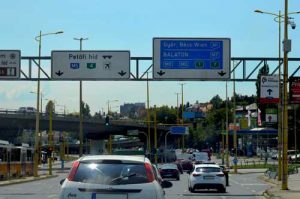 Saying goodbye to beautiful Budapest, we hit the road and are on our way to Lake Balaton, the largest lake in central Europe. It is a sunny, 33 degrees and we are encountering lots of traffic jams and or slow moving traffic. Rather than getting frustrated, we stop and have a picnic beside the road at a rest area, letting our dog Fritz have a little run and do some sniffing while the traffic hopefully lessens. Finally, at 3:45 pm, we arrive in the holiday town of Keszthely, located on the southwest shores of Lake Balaton. Without complication we find our guest apartment. 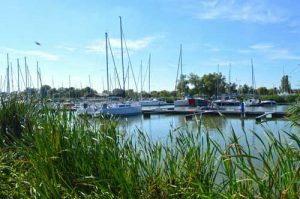 Check out my review here: Leander Haz 21, Keszthely, Lake Balaton – Review. After quickly unpacking we are on our way to the beach! The walk to Libás Beach takes us around 15 minutes, but to our shocked surprise, not only are dogs NOT allowed in the beach area, there is an admission fee of 500 forint / €1.65 for adults and 350 ft / €1.15 for children. It is advertised as the newest beach for those looking for “peace and quiet”; shockingly the beach was over ran with people. If you want to go, the address is 8360 Keszthely, Libás strand. Opting for a walk on the waterfront, we find a wonderful, quiet path with beautiful lake views. A few people are suntanning, others are fishing, picnicking or just enjoying the peace. The walkway leads around the marina area called Yacht Kikoto where sailboats are making their clanging sounds in the gentle, almost non-existent breeze. Back at the apartment, we sit in the small, very pretty, deserted garden to have a cold drink and relax. Fritz is content bouncing through the grass and sniffing at the trees. For dinner we cook a pot of pasta in our apartment kitchen which we enjoy out on the terrace; drinking wine, eating pasta and relaxing! A barrage of mosquitos arrives at dusk, chasing us into our room. The next day, following a late self made breakfast of grilled sandwiches, we are drive to the town of Fonyód where there is a dog friendly beach. It was about a thirty minute drive by highway. The temperature is a hot sunny 37 degrees – perfect for swimming. We drove into the area of the train station and turned left for dog beach. There was lots of parking available. Surprisingly, there were hardly any people here, so it was a relaxing day with Fritz enjoying the opportunity to cool off! Our third day we went to see the Festetics Palace home of the Helikon Palace Museum. 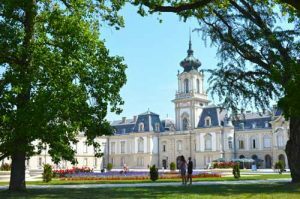 It was very quiet, considering it is one of the top attractions in Keszthely. I guess everyone was trying to stay cool at the beach due to the 37 degree celsius temperatures with the sun beating down. We fought it off eating lots of ice cream and drinking cold beverages ;-). Admission is charged for entry to ALL buildings on the palace grounds. We simply wandered around the grounds as dogs are NOT allowed into any of the museum buildings. 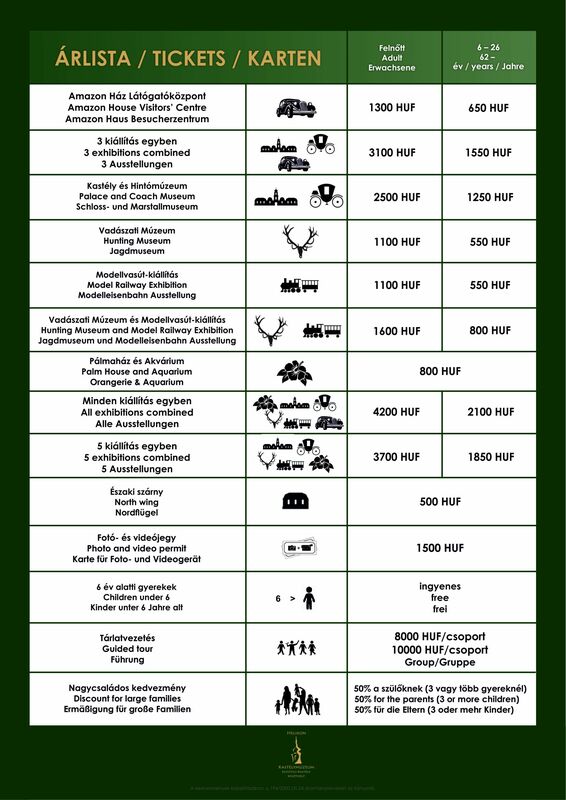 Entrance fees are varied, but to see everything, it will cost 4200 ft / €13.81 per person. The rest of the day we lazed around in the Aparthotel garden with our hotdog Fritz ?. 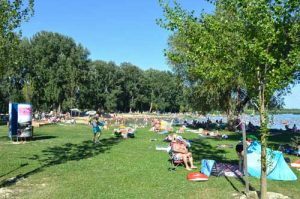 Info: There are 3 beaches with ample parking in Keszthely – Helikon Beach, the Municipal Beach and Libás Beach – all cost an entrance fee. Also readily available are supermarkets, restaurants, a veterinarian, a park, a huge bus station, a train station, a museum / palace, shopping (of course) and a lot of people. It seems every house is a room rental. This is a resort town where people drive, walk or bicycle to the beach or downtown depending on where their accommodations are. Restaurants are expensive and nothing is free.